What does 5.8-inch phone means? How can I use the screen size calculator? 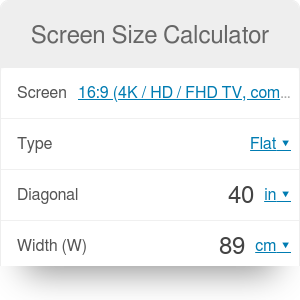 Screen size calculator can help you in determining the screen dimensions. Have you ever wondered what does it mean that diagonal of the screen is equal to 40"? How much space does it take on the wall, what's its height and width? Here you can determine the monitor size or phone screen dimensions. If you want to find the ideal size of your TV or its distance from your eyes, check out this TV size calculator. Another useful tool is this great projector calculator, which can help in fulfilling your dreams about a home cinema. Aspect ratio is the relationship between the height and width of a rectangular display. Every device with the screen is using that value - your laptop, smartphone, tablet, monitor or projector. However, it doesn’t tell you how big a screen is. It only explains the proportion between the height and the width. height = 5.8" / √ ((16/9)² + 1) = 5.8" / 2.04 = 2.84"
width = (16/9) * 2.84" = 5.06"
Great! Now we know the screen area and how tall and wide it is. The screen size calculator is here for you to calculate it right away. Let's say that we want to compare two smartphones: The Apple iPhone X with a 5.85-inch display and the iPhone 8 Plus which has a 5.5-inch screen. We could expect that the former has a bigger screen, but we can't forget about aspect ratios! iPhone X has narrower screen with 2.17:1 ratio and iPhone 8 Plus has standard 16:9. Choose the aspect ratio. Let's start with iPhone X with the aspect ratio equal to 2.17:1. As that ratio is still not very popular, you can't select it from a drop-down menu - write it down manually in advanced options fields. The first value of aspect ratio is 2.17 and the second value is 1. Enter the diagonal. iPhone X's is equal to 5.85". As a result, you obtain screen dimensions: width and height but also screen area. In our case those are equal to 5.5", 2.03" and 11.11 in². Repeat the steps for iPhone 8 Plus, choosing 16:9 aspect ratio and 5.5-inch diagonal. And what do you get? 4.8" for screen width, 2.7" height and 12.93 in² screen size. So even though the first iPhone has longer diagonal, the screen size is smaller than in iPhone 8 plus. (iPhone X also has the big cutout and the curved edges, but we are not taking them into account - even with that simplification the screen area is smaller). Screen Size Calculator can be embedded on your website to enrich the content you wrote and make it easier for your visitors to understand your message.